Any day I can read an historical fiction novel by C.W. Gortner is a great day. 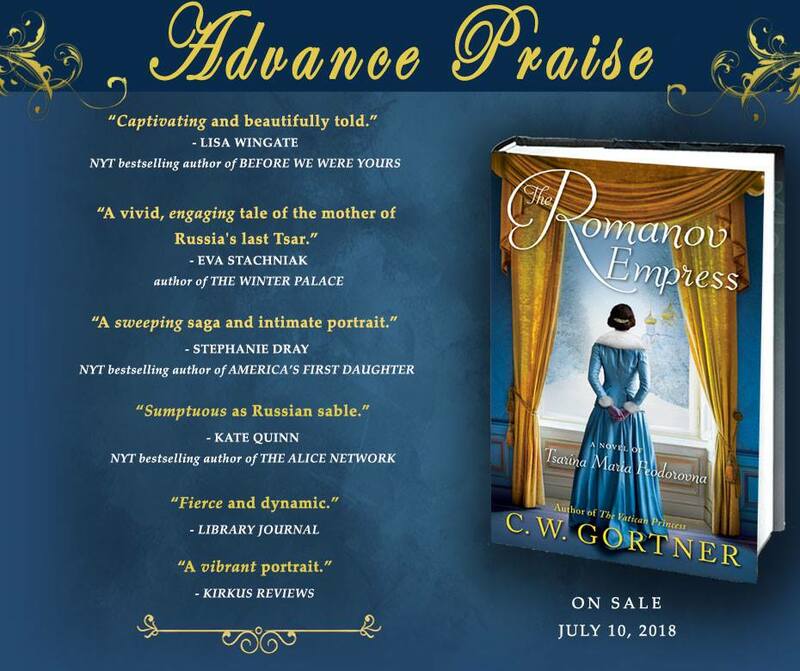 This time Mr. Gortner takes on that famous Russian dynasty with The Romanov Empress. I thank Historical Fiction Virtual Book Tours for sending me a copy at no charge. Most are familiar with the story of Nicholas and Alexandra and their children. The horror of their executions has resonated through history. The subsequent mystery of were they all killed or did Anastasia survive kept that family at the forefront of Russia’s pre-revolution history. But before Nicholas and Alexandra there was long line of Emperors and Empresses. This book brings the life of one of them to vivid life. 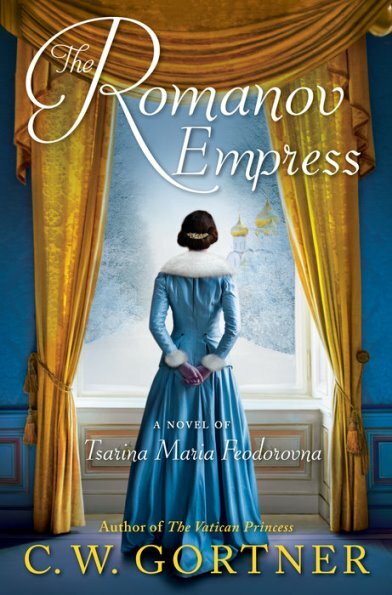 Empress Maria Feodorovna is the subject of this rich and fascinating book. I will admit to not knowing all that much about her. Most of the reading I’ve done has focused on the more tragic Romanov. Empress Maria has proven to be a most compelling subject and I find myself wanting to know more. She came to Russia as a 19 year old bride not for the man she expected to marry but rather for his brother. She was engaged to Nicholas (yes another one by that name) but he died unexpectedly. She then married his brother, Alexander. They had a solid marriage despite Alexander’s moving the country backward from his father’s moves for a representative Duma. It was a time of great upheaval and forces were actively trying to kill the royal family. Alexander did not agree with his father and his attitudes most likely did not help what was to come. Nor did he do his first born any favors in regards to how to rule a country. The history is the history and I’m not going to relay it any further within this review. Mr. Gortner does an exceptional job of weaving the march of revolution through his story of this amazing woman. For it is Maria’s story. Many others play important roles but she is the star and she is brought to vivid life. Her passion for her country, her family and her causes is present as well as her humanity. Even though she was Empress of all the Russias, she was also a wife and mother. The world that the characters inhabit is also brought vibrantly to life. The descriptions of the various palaces in the different seasons were magical. The fashions were deliciously described and the parties of the royal family and their ilk were lavishly portrayed. Mr. Gortner has that magic way with words to bring a world to life so that you forget you are reading and you just float through a world until sadly, it ends. There was not going to be a happy ending to this book unless it ended somewhere other than the end. It doesn’t quite finish Nicholas and Alexandra’s stories but it is not their tale. It’s the story of a young girl who became a remarkable Empress. It is well worth reading for those that know and enjoy the history of Russia and for those that want to start to learn about how rich and dramatic it is.